As we look at this verse, it can appear confusing. It sounds, at a glance, that we are asking that God Himself would not lead us into temptation, yet we know that God cannot be tempted with evil nor does He tempt anyone [James 1:13]. If this is something God cannot do, it seems pointless to ask Him not to do it! In addition, James tells us to count it all joy when we fall in temptations [James 1:2] and that we are then blessed [James 1:12]. So are we asking God not to give us this blessing and joy - which He apparently cannot do anyway? 1. God cannot be tempted with evil [James 1:13]. 2. God does not tempt anyone [to evil] [James 1:13]. 3. We should not accuse God of tempting us [James 1:13]. 4. Temptations - or their victorious results - are a joy and blessing [James 1:2, 12]. We know that however we understand this part of the Lord’s Prayer, it cannot contradict the above items. Perhaps it will be easier to start with a Biblical illustration of what happened when someone was told to pray in order to avoid temptation and yet failed to do so. Jesus in the Garden of Gethsemane on the night He was betrayed told Peter [and James and John] to “watch and pray so that you will not fall into temptation” [Matt. 26:41, NIV]. And we know what happened, they fell asleep and later when Peter was tempted to deny the Lord, He did [Matt. 26:69-75]. 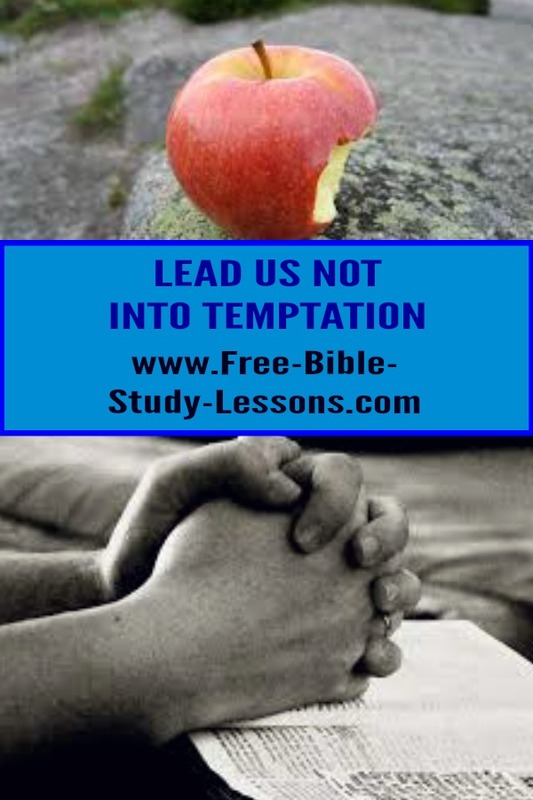 This is then what Jesus is warning about in the Lord’s Prayer, not that God would lead us into temptation but that but that He would prevent us from being led into temptation by our own human weaknesses and folly. Vine’s Expository Dictionary of Old And New Testament Words has this to say about this verse: “…where believers are commanded to pray not to be lead into forces beyond their own control” [pg. 117]. When we pray this part of The Lord’s Prayer we are in humility recognizing that we are weak and prone to sin. We are saying that we do not want to fail our Lord, but that we do not trust ourselves to remain true. Peter loved the Lord. He did not want to fail, but because he was unprepared - operating with his own strength - when the crisis came he did. Likewise, we may love the Lord and have the best intentions, but we are warned not to trust in ourselves. We need to look to Jesus. We need the strength of the Holy Spirit. We need the watchful care of the Father. David knew that even through his heart loved God and wanted to serve Him, his human nature and abilities were not to be trusted. He needed God’s help. Why did David fail in the temptation with Bathsheba? The king, in those days, was supposed to lead his army into battle. For the first time, David stayed home. He was not where he was supposed to be and so he was unprepared when temptation sneaked up on him. He then let his sexual appetites rule his thoughts and actions and his kingship “went down hill” from this time on even through he received forgiveness. We are, remember, truly circumcised when we worship God by the Spirit, when we find our joy in Christ Jesus and put no confidence in what we are in the flesh. We put no confidence in our ability including our ability to withstand temptation. So in prayer we recognize that we must continually look to God, trust in Him and be on our guard. So could Peter and David then justify their sinful actions with the excuse that the temptation was too powerful, that they had no control? Absolutely not!. They had the physical ability to say “No” and defeat the temptation [just as every human being as the physical ability to accept Jesus as Lord and Saviour], but what they lacked was the moral strength or will to say “No” at that point in time. Every non-Christian is without excuse for rejecting Jesus as Lord because they have the ability to make that decision. And every Christian is without excuse for committing sin - any sin - because Christ has set us free and given us a new nature so we have the ability to say “No” to every conscious sin. So when Christians fail, do they have condemnation? No. Condemnation is always a weapon of the enemy. He likes to have it both ways - he tempts us into sin and then condemns us for committing it! Christians come to the Cross and get forgiveness and move on [although, like David, there may be consequences to be dwelt with on a human level]. So we are asking that God will give us the knowledge and application of the victory that Christ has won on our behalf. That we would not trust in ourselves but trust in Him that we will have the moral ability to walk in victory. This comes through prayer and understanding who we are in Christ. We know that God will never allow a temptation that we do not have the physical ability to withstand and neither will He allow a temptation that we have not had the opportunity to have the moral will to withstand. Our God is a Strong Tower - if you feel overwhelmed and unprepared run TO Him not away from Him. He loves you. The second part of section is a prayer to be deliver from “the evil.” Because the word “the” is there some translations say “the evil one” as it makes sense from the language. While it certainly includes being delivered from the evil one [i.e. Satan and his minions], it goes further than that. As we have seen above, it includes being delivered from the desires of our old [dead] sinful nature and habits. We have a new nature, but our mind has to learn it. In the process we experience phantom temptations. [A person who has a limb amputated often still feels very real pain the the limb that is no longer there. The nerves are lying to the brain, but the pain is real. This is called phantom or ghost pain.] The temptations are real as is the possibility of giving into them [which is why we pray the above prayer] but its a “memory” of something that is dead and gone. Part of the satanic temptation is to make us believe that the old sinful nature is alive. If we buy into that it doesn’t resurrect the old nature, but it does make the ghost pain longer and more intense. Over time, as our mind learns our new nature, the ghost temptations should decrease and fade although they will never be completely eliminated on earth.